Increased consumption of whole grains is an important health goal, and consumers around the world are making an effort to increase theirs. According to the Whole Grain Council, as of August 2012, its Whole Grain Stamp appears on more than 7,500 products in 36 countries. Of new products introduced globally from 2008 through September 2012, over 15,000 made a whole-grain claim, notes Lynn Dornblaser, director of innovation and insight at Mintel Group. The numbers of new products with this claim have steadily climbed since 2008, with 2012 numbers being on-track with 2011. In the U.S., as whole-grain products have become a standard part of product lines, new introductions with the claim have fallen slightly in the past few years. 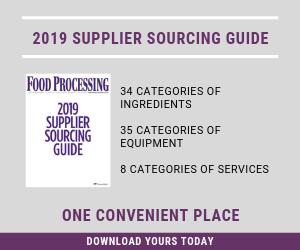 "The vast majority of whole-grain products is found in the bakery, cereal and snacks categories," says Dornblaser, "although a few creative products also appeared this year in the juice drink and processed meats/fish/eggs categories." This all begs the question, what is a whole grain -- beyond the requirement for the grain to include its bran, germ, and the endosperm? Merriam Webster defines a grain as "the seeds of fruits of various food plants including the cereal grasses and in commercial and statutory usage other plants (as the soybean)." This broad definition includes not only cereal grains (oats, wheat, corn, etc. ), non-cereal seeds (buckwheat, flax, wild rice and chia to name a few), but also nuts, from a botanical aspect. Claudia O’Donnell is managing partner and editor/content development for GlobalFoodForums Inc., a conference and seminar service provider. All have well-deserved nutritional reputations although they vary in nutrient content. For example, considering protein and fiber, whole, uncooked flaxseed is about 18 percent protein and 27 percent fiber; chia seed is 16 percent protein and 34 percent fiber; and lentils about 26 percent protein and 30 percent fiber, according to the USDA's National Nutrient Database for Standard Reference 24. In contrast, allergenicity-friendly brown rice has much lower levels of both nutrients, but like other whole grains, it possesses a healthful array of phytonutrients. The Whole Grain Council has more narrowly defined whole grains. The definition is crucial in that only those products with defined levels of specific grains may carry the Whole Grain Seal, which is an important signaling device to consumers that a food meets a quality nutrient standard. Broadly (and taxonomically) speaking, seeds from the Poaceae family are considered grains for the purposes of the seal. Others (amaranth, quinoa, and buckwheat) that are not from the Poaceae family are included as "pseudo-grains" due to similar preparation and nutritional profiles. The Whole Grain Council does not consider oilseeds and legumes (including flax, chia and sunflower seeds) to be grains. Not all agree with these classifications, however. "Flaxseed should be considered a pseudo-cereal in that changing food habits by consumers have meant it is prepared and used like other grains," says Daniel Best of Best Vantage Inc., who has been a consultant for several flaxseed suppliers. This case could also be made for chia seed, which a September 2011 USDA National Nutrient Database document notes is cultivated like cereals and made into flour, breads and similar products and thus calls chia seed a pseudo-cereal . The FDA has not yet ruled on a whole grain definition. Despite health benefits offered by seeds of any type, some manufactures argue their nutritional contribution can be further enhanced by taking advantage of plant enzymes. For example, the raw foods movement is alive and well – literally -- as it touts minimal heat processing of foods to avoid enzyme destruction. One eye-catching booth display at the 2012 Natural Products Expo East by Freeland Foods showed a time-lapse video of its flax bar sprouting into seedlings. A seemingly growing number of companies at NPEE offered products made from sprouted grains. The premise is that enzymes activated during sprouting makes the grains easier to digest, in effect "pre-digesting" portions of the grain, which also makes some nutrients more bioavailable. The Whole Grain Council’s website explains that two different approaches are used to make sprouted grain products. The grains can sprout and then be dried for later use (the dry approach). Alternatively the sprouted grains can be mashed, with the resulting puree made into baked goods or other products (the wet approach). Whatever the form or classification, the consumption of these seeds is alive, well and growing.